I'm a total closet bird nerd! I have a bird book and binoculars and a knack for remembering the first time I saw a bird species. The Northern Territory is full of amazing birds and on more than one occasion I've caused traffic chaos after seeing a rare bird by the side of the road (which after chucking a u-turn and narrowly avoiding being rear ended turns out to be a plain old plover). Lots of people call me Yo (the first part of my name) but my very curly hair has also inspired nicknames like Curly Girly, Afro Girl and the not so great Dunny Brush. At the moment I’m most afraid of missing out. I have always been a pretty organized and motivated person. If I’ve wanted something, I’ve worked out a way to make it happen and chipped away until it’s become a reality. Last year, when my first daughter was born, my world was turned on its head. All of a sudden the time I’d had for making things happen was gobbled up by being a mum – breastfeeding, washing nappies, cooking, playing, cleaning up (again!) and catching up on sleep. I really love being a mum but I’m worried that if I don’t find more time for writing I might miss all the wonderful opportunities that I know are out there. Organised, curious, empathetic and open to feedback. I think I’d like to be the Number One Ladies’ Detective from Andrew McCall Smith’s series of the same name. She’s rather mischievous, has a great sense of humor, knows when it’s ok to bend the rules and enjoys food almost as much as I do. Oooh… that’s tricky. I’m interested in the women’s suffragette movement so I’d probably choose the early 1900s. Only I wouldn’t want to get stuck there. Imagine trying to organize a social uprising without social media! Most recently I’ve been inspired by Alison Lester and Sally Rippin (whom I’m sure you all know!) Alison Lester has a special talent for making the everyday magical. In her books, a pile of boxes is transformed into a castle and a long road trip becomes the adventure of a lifetime. I love the way Alison weaves fiction and non-fiction so that you can’t see where one ends and the other begins. I’ve also been very impressed by her commitment to literacy development in remote Indigenous communities. Alison provided advice during the development of Too Many Cheeky Dogs. How she managed to find time to help us out, I have no idea! When I first approached her she said something along the lines of ‘People helped me out when I was first getting started so let’s give it a go.’ It’s this kind of generosity that keeps the Australian picture book community so vibrant and collaborative. I hope when I’m a famous picture book writer & illustrator (wink wink) that I can give back to others in the same way. The other person who has been a recent role model for me is Sally Rippin. I attended one of her writing workshops when my daughter was four months old. I was the only person there with a baby and I had to keep ducking out to feed her. After the workshop, Sally told me about her experiences juggling writing and being a mum to three children. I was taken aback by her ‘anything-is-possible’ approach and when I come up against other obstacles (of which there are many!) I find myself asking, what would Sally Rippin do? It’s hard to isolate one influence but I’d probably have to say reading. It was reading that made me start writing. When I was in grade one as part of a class assignment, I created my first picture book – The Martian King. Without my knowing, my gran kept it (aren’t grannies fabulous!) and 23 years later when it was returned to me, I realised it was a total rip off of Dr. Suess’s The Lorax. My version starred a terrifying Martian King-turned-tyrant who was polluting the world and threatening people with a troop of evil warrior fruit bats (random!) but the plot was largely a Lorax rewrite. Plagiarism aside, I was startled by the obvious link between what I’d been reading at the time and what I’d written. It makes sense. What you read shapes the way your see the world and how you express yourself. Reading also cultivates a love for books and the imagined worlds they contain. Being exposed to picture books from a young age was the foundation for what would later grow in to a desire to create picture books of my own. At the moment I love the word anthropomorphize. It means to give human traits to a non-human object like a plant, animal or car. In Too Many Cheeky Dogs, some of the dogs have been anthropomorphized. Dion Beasley, who illustrated Too Many Cheeky Dogs wasn’t too keen on this at first. Dion, who is profoundly deaf and has muscular dystrophy, has been drawing dogs since he was eleven years old, but he usually draws dogs doing ‘doggy things’ like running, eating, sleeping and fighting. Luckily Dion’s carer came to the rescue, miming an entire quarter of football on the patio while Dion watched in astonishment. As we sat back to catch our breath, a smile crossed Dion’s face and without looking up he drew a football contest between a pack of cheeky dogs and an equally cheeky herd of donkeys. It’s still my favourite scene in the book. At the moment I would have to say The Divided Heart: Art and Motherhood by Rachel Power. I find it difficult balancing motherhood and creativity and in her book, Rachel Power looks to Australia’s leading mother artists for inspiration on how to find a workable equilibrium. I’ve reread it several times and each time I get something different from it. Johanna's first picture book, Too Many Cheeky Dogs, was published in June 2013 by Allen & Unwin. 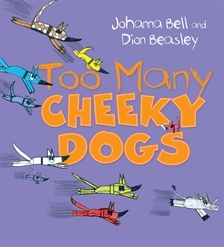 For more information about Johanna Bell and illustrator Dion Beasley, visit the Too Many Cheeky Dogs website.